Pizza Restaurant Oakland: How Do You Feel About Pineapple? What is Your Stance on Pineapple? Hello, and welcome back to our blog! As a pizza restaurant, we here at Five10 Pizza had to make a decision when we opened our doors. Were we going to offer a pizza with pineapple or were we the type of pizza place that saw that as a form of sacrilege? While this might seem a little dramatic, the debate surrounding pineapple on pizza is one that has sparked many an argument and, most likely, is a debate that is going to rage for as long as people eat pizza. In our previous post, we went over a little of the history surrounding pineapple on pizza and some of the science behind why this fruit seems to lend itself so well to pizza in the first place. In today’s post, to try and give a fair and balanced look at this subject, we are going to list out some pros and cons of having pineapple on your pizza. Continue reading below to learn more. The sweet and savory combination of pineapple and ham is hard to resist once you have had it. Few pizza topping combinations are able to offer the same burst of flavor. Pineapple contains Vitamin C, meaning that when you eat pineapple on a pizza you are actually eating something healthy! Pineapple, more so than many other toppings, holds up well. This means that if you want to enjoy a cold slice, you don’t have to worry about the integrity of the pineapple being compromised. Traditionally, pineapple has no place on pizza. If you order pineapple on a pizza at an old school pizza restaurant, you may get the stink eye from the people begin the counter. Pineapple limits the variety of toppings that you can place on a pizza. While ham, bacon, onion, and cream cheese (yes, cream cheese) are all excellent toppings in terms of complementing the flavor of pineapple, other toppings such as Italian sausage and mushrooms do not mix as well with the sweet flavor that pineapple provides. Pineapple on pizza means more calories. As you can see, there are just as many reasons to dislike pineapple on pizza as there are to love pineapple on pizza. When you get down to it, the debate is based entirely on personal preference which probably explains why there is such passion around this topic. 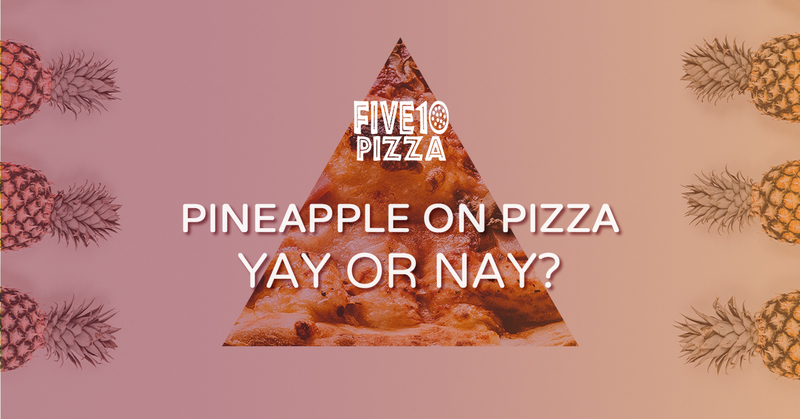 Whether you enjoy pineapple or not, we here at Five10 Pizza hope that you can at least respect the opinions of your fellow pizza lover and realize that, deep down, we all still agree on one thing: pizza is the best. Thank you for reading our short blog series on pineapple and pizza. If you would like to learn more about the pizzas that we have or you would like to see if pineapple on a pizza is right for you, please visit our Oakland location today and sample our selection. We are dedicated to bringing the best pizza possible to Oakland area residents and we are confident that once you taste our pizza you will see what makes us one of the best pizza restaurants in the city.